He was vetted weeks after stepping down. 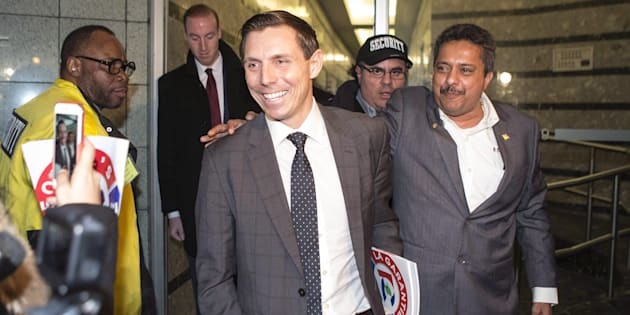 TORONTO — Ontario's Progressive Conservatives are allowing ousted leader Patrick Brown to run as a candidate in the spring election, greenlighting his bid to reclaim the party leadership. The decision was announced today by a party committee tasked with vetting Brown, who was forced to resign as leader amid sexual misconduct allegations, and three other candidates vying for his former job. Since joining the leadership contest on Friday, Brown has been dogged by allegations of mismanagement and corruption, which have led one Tory legislator to file a complaint with Ontario's integrity commissioner. He's also been accused of exaggerating membership numbers after an internal audit found the party has about 67,000 fewer members than the 200,000 Brown has previously taken credit for. The 39-year-old politician, who was a federal Conservative MP for Barrie, Ont., under prime minister Stephen Harper, has denied all allegations against him and vowed to continue his fight until his party defeats the Liberals in the June election. Ontario's Progressive Conservatives will begin voting for a new leader on March 2 with the results announced on March 10.